What is the Sikh view on Aarti? From Sanskrit Aarti, meaning the light or the vessel containing it which is waved before an idol, generally in the clockwise direction, accompanied by the chanting of mantras. This is also the name given the ceremony, which for the Hindus is a mode of ritual worship to propitiate the deity. In the Sikh system, which totally rejects image-worship, there is no permission for this form of worship. Guru Nanak Dev Ji at Jagannath Puri Mandir. According to the Janam Sakhis, Guru Nanak Dev Ji accompanied by Bhai Mardana Ji, stopped near the temple of Jagannath, which is dedicated to Hindu god Vishnu. Guru Nanak Dev Ji and Bhai Mardana Ji stopped near the shrine upon which sat centuries of history mute and immobilized. The notes from Bhai Mardana’s Rabaab (rebeck) touched the devotees’ hearts with fresh fervor. Several of them came to hear the Guru’s word. The temple priests felt angry and held the Guru Ji guilty for not making adoration to the deity within the sacred enclosure. The local chief whose name has been described, as Krishan Lal one day visited the Guru and invited him to join the aarti, or the evening service of lights, in the temple. The Guru readily offered to go with him. And the sun and the moon the lamps. The luminous stars on the heavens are the pearls. And the vast forests wreath of flowers. The unstruck music of creation is the trumpet. O’ Thou dispeller of doubt and fear! Guru Nanak Dev Ji taught the listeners, how Nature’s tribute to the Creator was superior to any ritualistic oblation offered before images. 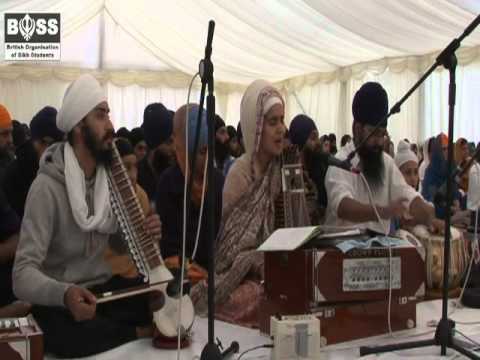 Every evening in all Gurudwaras, after the recitation of Rehraas Sahib, the Keertan (singing) of Aarti through Gurbani shabads is performed by Raagis (musicians). This is a tremendously soothing experience, capable of taking us directly into the spiritual realms of devotion through music. Once actor Balraj Sahni asked the late Nobel Laureate Rabindra Nath Tagore, “You have written the national anthem for India. Can you write an international anthem for the whole world?” “It has already been written, not only international but for the entire universe, in the 16th century by Nanak,” replied Tagore. He referred to the Sikh aarti (ceremony of light). Tagore was so enamoured of this universal aarti that he personally translated it into Bengali. In the mid-18th century when the Khalsa had to live in the jungles because they had a price on their head, Nirmala and Udaasi Mahants (caretakers) took care of the Gurdwaras. During this period the Nirmala and Udaasis came under the influence of Hinduism and introduced Hindu practices to Sikh institutions. Over time the Mahants became more powerful and although the Sikh Gurdwaras were freed from the clutches of the corrupt Mahands in the turn of the 20th century through the Singh Sabha and Gurdwara Reform Movements. Although the Gurdwaras were freed and Sikh Maryada (Code of Conduct) was re-introduced to Sikh institutions, some Sikh institutions in India that were outside of the Panjab or in the hands of certain Nihangs or Sants continued practising some Hindu rituals. One of the rituals is “performing” Aarti. Singing the Keertan of Aarti is a Sikh practise, however performing Aarti by waving a platter with oil lamps and flowers whilst ringing bells is a Hindu practise. People who have not understood the actual message with the Shabads of Aarti in Sri Guru Granth Sahib Ji, and are instead practising what the Guru condemns. d. Anything except the afore-mentioned reverential ceremonies, for instance, such practices as the Aarti (waving of a platter with burning lamps and incense set in it in vertical circular motion) with burning incense and lamps, offerings of eatables to Sri Guru Granth Sahib Ji, burning of lights, beating of gongs, etc., is contrary to Gurmat (the Guru’s way). However, for the perfuming of the place, the use of flowers, incense and scent is not barred. For light inside the room, oil or butter-oil lamps, candles, electric lamps, kerosene oil lamps, etc., may he lighted. So going by Gurmat and Gurbani, only the sitting and singing of Aarti in Keertan form without lighting lamps is permissible, as lighting of lamps like the Hindus did at Mandir in Jagannath is contrary to teachings of Sri Guru Granth Sahib Ji. 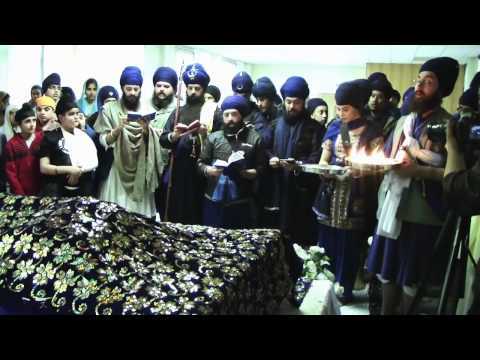 « What is the Sikh view on the Christian belief of God sacrificing? Jathedar Akal Takhat should order banning of Aartee at Hazur Sahib and Patna Sahib. I once saw a video of goat sacrifice at Hazur Sahib….did Guru Gobind Singh Ji start this practise over there ?